Flame painting first lit up the hot rod world more than 50 years ago—and it’s still burning strong. At the heart of the art are a handful of innovators who have pushed the tradition to ever-greater heights over the past half-century—and these are the artists profiled in this book. 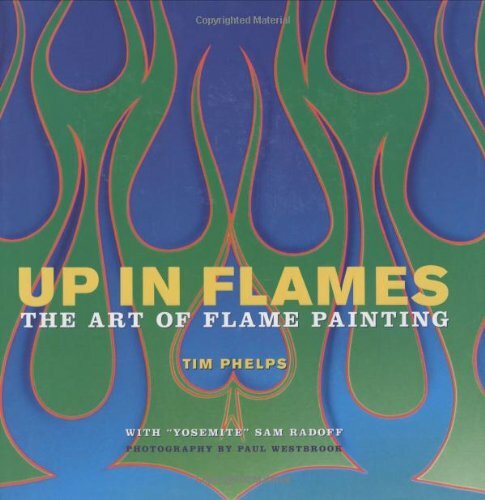 Up in Flames introduces readers to the flame painters who best represent the talent and inspiration that give this particular art form its power, and whose stories best illustrate the evolution of the flame job. Each profile features full-color illustrations and photographs, examples of an artist’s range, and the painter’s own thoughts on style, career, and craft—all framed by an introduction that traces the flame job from its infancy to today’s modern techniques and designs. Also included is a unique and comprehensive - over 5 pages - timeline of the history of flames and painting. The profiled flame artists are: Dave Bell, Don “The Egyptian” Boeke, Robert E. “Bobbo” Dunn, Pete “Hot Dog” Finlan, Craig Fraser, Jack “The Italian” Giachino, Cary Greenwood, Art Himsl, Keith Knecht, Herb “The Line Doctor” Martinez, Tommy “Itchy” Otis, Rory Pentecost, Rod Powell, “Yosemite” Sam Radoff, Dennis Ricklefs, George Roybal, Steve Vandemon, and Mike “Wet” Willey.